Hollywood glamour defined an era and was full of opportunity for bold self-expression, and what we love is recreating a vintage glamour look within a contemporary space, showcasing the splendour of that time and using a combination of gorgeously luxurious modern and classic pieces. Defined by elevated and sophisticated décor, we instantly fell in love with our vintage glamour inspired look. It’s decadent, sumptuous and wholly inviting, enveloping you in plush fabrics, mirror and gold. We urge you to welcome it into your home and embrace your glamourous side! Think mirrored surfaces, cleans lines and glimmers of gold. It’s softly elegant and effortlessly glamourous but isn’t overwhelming and doesn’t feel ‘themed’. 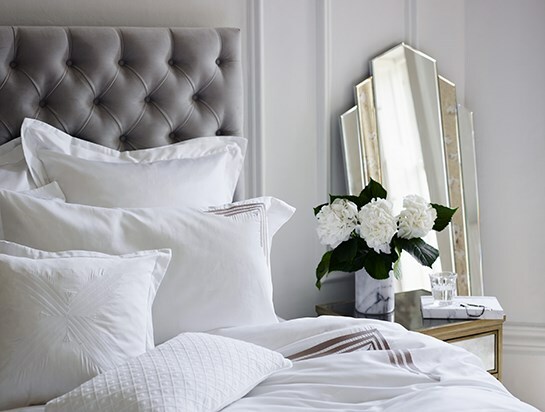 We adore the cool combination of greys, golds and whites to create a beautifully luxurious, vintage look. Our stunning Juliette Divan Bed in Silver Plush Velvet is a statement Chesterfield style bed with deep buttoning and exudes utter sophistication. Layer in sumptuously soft pillows (as many as will fit) to contrast perfectly with the clean lines of our Art Deco inspired chest of drawers. Nothing says glamour more than Art Deco and our, aptly named, Gatsby 3 Drawer Bedside Table effortlessly channels decadence and charm. 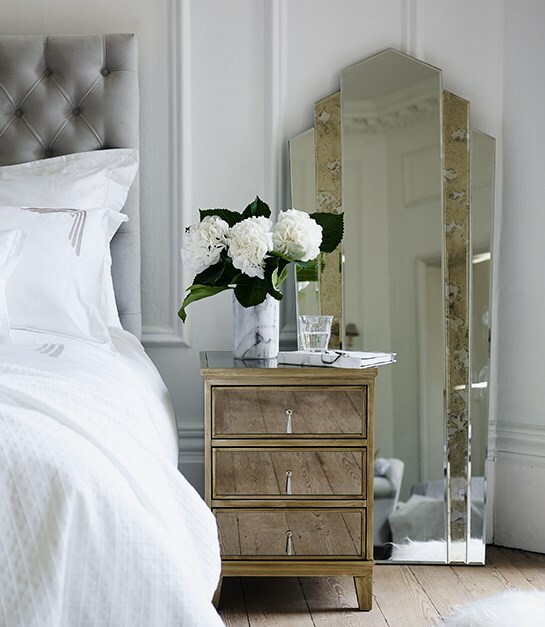 Inspired by Hollywood Regency, this bedside table is a must for any vintage glamour inspired look. Clean lines can be contrasted with a softly draped, luxurious throw such as our Silver Chinchilla Faux Fur Throw and matching cushion, or our Francis Velvet Throw in Mink-Silver, as shown above.